New Grub Street is the first novel in this series explicitly to address, in a realistic narrative, the contemporary working conditions of a new class, the professional author. 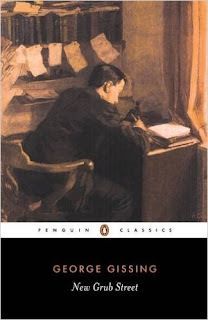 George Gissing, born the son of a chemist in 1857, was breaking important new ground, as well as responding to significant cultural change in the literary generation after Dickens (David Copperfield) and Thackeray (Pendennis). By contrast, the eponymous hero of David Copperfield (No 15 in this series) is a writer, of course, but Dickens's focus is chiefly on Copperfield's childhood, not his career as a novelist. He never delves as painfully as Gissing does into the threadbare texture of Victorian literary life. Part of this is due to the social and cultural upheavals inspired by Forster's Education Act of 1870. Gissing's career as a man of letters was the product of this. For the rest of the century, the lives of writers and readers would undergo a profound transformation which would comprehensively reshape the British literary landscape. Henceforth, high and low literary culture would increasingly diverge. This is one of the main themes in John Carey's important critical study The Intellectuals and the Masses. It is also the animating idea ofNew Grub Street. Gissing was hardly alone in finding the role and conduct of the modern writer an urgent topic in late Victorian literary London. A year before New Grub Street, Henry James also published a novel, The Tragic Muse, about "the conflict between art and 'the world'", though James focused on painting and the stage more than literature. In 2014, in the midst of another paradigm shift, Gissing's subject remains as topical as ever, and addresses timeless themes in the everyday life of the full-time, professional writer. In New Grub Street, the narrative is set in the literary world with which Gissing himself was intimately familiar; the title refers to the London street that, in the age of Samuel Johnson and Laurence Sterne (No 6 in this series), was synonymous with hack writing. By the 1890s, Grub Street no longer existed, though hack writing, of course, never goes away, with timeless imperatives. As one character puts it: "Our Grub Street of today is supplied with telegraphic communications, it knows what literary fare is in demand in every part of the world, its inhabitants are men of business, however seedy." The novel's protagonists are a contrasted pair of writers: thoughtful Edwin Reardon, a shy "literary" novelist with few commercial prospects; and Jasper Milvain, a hard-driving young journalist who treats his writing as the means to an end in a ruthless literary marketplace. "I speak," he says, "only of good, marketable stuff for the world's vulgar." Reardon will die, unfulfilled, in poverty; Milvain will flourish in literary London ("I write for the upper-middle-class of intellect, the people who like to feel that what they are reading has some special cleverness"), navigate a complicated love life, and eventually marry Reardon's widow, Amy. New Grub Street is Victorian in its realist depiction of a society in transition, but modern in the way it harks forward to the imminent new century with its portrait of the artist as an existential character making his solitary way in the world. The hero of Jude the Obscure, the next novelin this series, Jude Fawley, a working-class boy who dreams of becoming an Oxford scholar, is Reardon's West Country equivalent. New Grub Street, a regular "three-decker" novel, was first published in three volumes by Smith, Elder & Co in 1891. There was no serialisation. Gissing already had a modest reputation as a novelist of working-class conflict from books such as Workers in the Dawn, Demos, Thyrza andThe Nether World, but had not achieved much financial security. In the 1890s, he began to write about middle-class life, with books such as The Emancipated, Born in Exile, The Odd Women and The Paying Guest. In 1890, having completed, and sold the copyright for, The Emancipated, Gissing began work on a succession of new novels, none of which prospered in his mind. In April 1890, we find him beginning work on a new manuscript entitled "A Man of Letters", but then becoming distracted by other projects. Finally, in October 1890, he records "a fresh beginning" on a novel now entitled New Grub Street, which was swiftly completed in December. The proofs arrived from the publisher in February, and Gissing's masterpiece appeared on 7 April 1891. Later, for George Orwell, he was "perhaps the best novelist England has produced". Orwell argued that Gissing's "real masterpieces" were The Odd Women, Demos and New Grub Street. For Orwell, the central theme of these books is simple: "not enough money". Orwell's interest, as an indigent literary man, is understandable. From a longer perspective, it is New Grub Street that establishes Gissing as a writer of importance alongside George Meredith (not included in this series) and Thomas Hardy. Demos (1886); The Odd Women (1893); The Private Papers of Henry Ryecroft (1903).